The name speaks for itself: international genes and an international ownership mark Global Player as something very special. He was the clear champion at the Oldenburger main licensing 2018 in Vechta, with his unique charisma. All three gaits promise highest quality with convincing rhythm, energy and dynamic impulsion in trot and constant uphill tendency in canter. First saddle tests have shown that this is an exceptional horse in the making. The sire is the Apache-son, Kastel's Grand Galaxy Win, who was a finalist at the WCYH 2016 for five-year-old horses under Severo Jurado Lopez and is now successful up to S-level. In the pedigree you also find exclusive genes from Jazz, Flemmingh and Michelangelo. The grand sire, Don Schufro, was Danish champion in Grand Prix and team bronze winner at the 2008 Olympics in Hong Kong under Andreas Helgstrand and also sired many successful offspring. For several years he had a leading position of the WBFSH ranking list of breeding sires. Further out in the pedigree you find Ravage Quintus, the famous Trakehner stallion Donauwind and the well-known Swedish stallion, Herzog, who sired Marzog that was successful under Anne Grethe Thörnblad. Global Player is licensed in DWB, OLD, WESTPH, Süddt. Verbände, Mecklenburg, Rheinland. 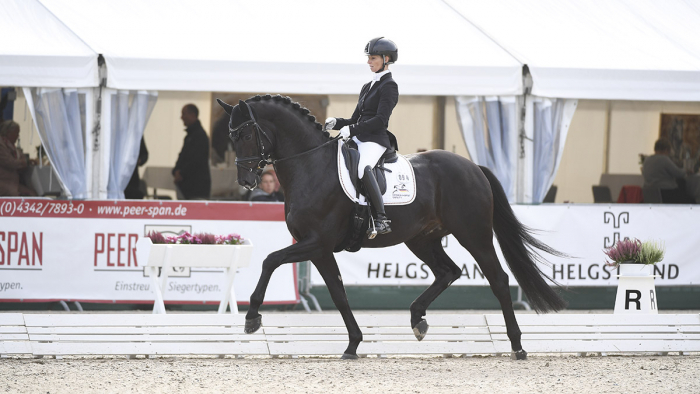 Global Player is stationed at Helgstrand Dressage.